We layer on extra jumpers, jackets and coats in winter, but what about layering up skincare to protect and properly hydrate our skin from the freezing wind, rain and icy chill in the air? I've been taking time to use thick balms as moisture masks, lay off the twice weekly clay mask sessions (I still do one a week if my skin is freaky) and of course up my water intake, mainly in the form of several cups of hot spearmint tea everyday. I am also introducing an extra layer or two into my skincare regime morning and night to make sure my skin doesn't shrivel up like a prune. Lovely. My first pick for some serious hydration in recent weeks has been the Pestle & Mortar Pure Hyaluronic Serum. This has an incredible fluid/jelly texture and sinks into skin in moments. I really notice a difference when I've been using this and it's a great one to mix with other creams and oils to get everything on there in one fell swoop. The ingredients list is nice and simple (though my one bugbear is that it contains phenoxyethanol which I do try to avoid) and I've gone through my bottle really rather quickly as it's so easy to use nearly a full pipette's worth each time. 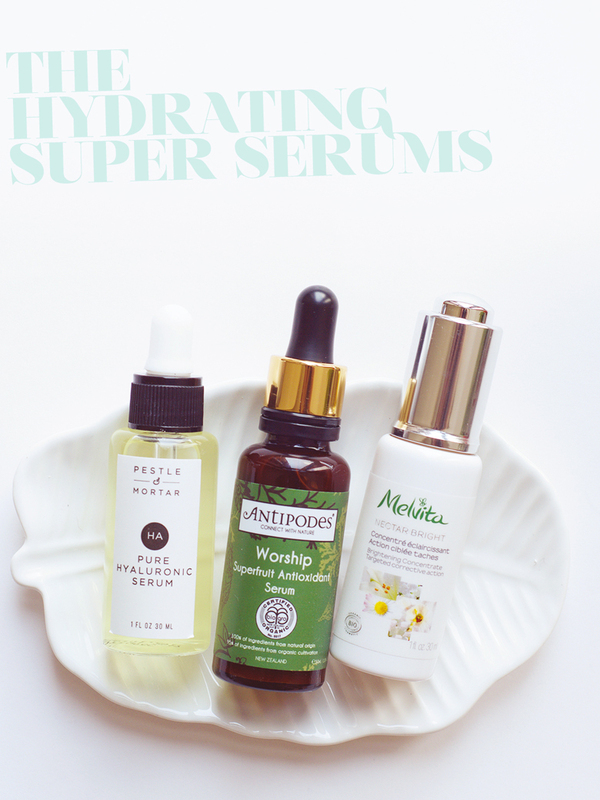 The Antipodes Worship Serum is a new(ish) release from the brand and whilst it's not my favourite serum from antipodes (that's always gonna be Apostle) it's a lovely water based, very liquid serum that is amazing for hydrating very easily irritated, congested, blemish prone, or oily skin. It's so lightweight you can barely tell you've applied anything at all whilst your skin is soaking up all of that superfruit goodness. I love mixing this with a drop or two of a facial oil in the mornings as the serum helps the oil absorb without any greasy residue and I can get to applying my makeup in double quick time. As always from Antipodes you can expect this serum to smell good enough to eat and the ingredients are like a delicious fresh fruit salad. Grapes, coffee berry, acai, raspberry water, boysenberry, blackcurrant and more. Finally, a more targeted treatment serum that also hydrates skin quite nicely. The Melvita Nectar Bright Brightening Concentrate makes use of the brightening and clarifying properties of five different plants with white flowers to create their Nectar Bright line. This concentrated serum promises to even skin tone, prevent and protect from future hyperpigmentation and leave skin illuminated. Lemon water, lactic acid and daisy extracts are the main stars of the show and though I haven't used this consistently enough to notice brightening just because of this, it does leave my complexion looking rather radiant after application. TLDR; Dehydrated or dry, flaky patches? Pestle & Mortar. Oily, dull, or spotty? Antipodes. Scarring, pigmentation or lacklustre? Melvita.